Warmer, more humid air will enter New Jersey's atmosphere for the first half of the week, but the chill is expected to return by next weekend. Holy thermal underwear, Batman! This weekend was downright frigid across the Garden State, as low temperatures dipped into the teens and highs struggled to warm past the upper 30s. A brisk wind (particularly on Saturday) certainly didn't help the situation. I estimate Sunday morning to be the second coldest morning of the 2016-17 winter season. 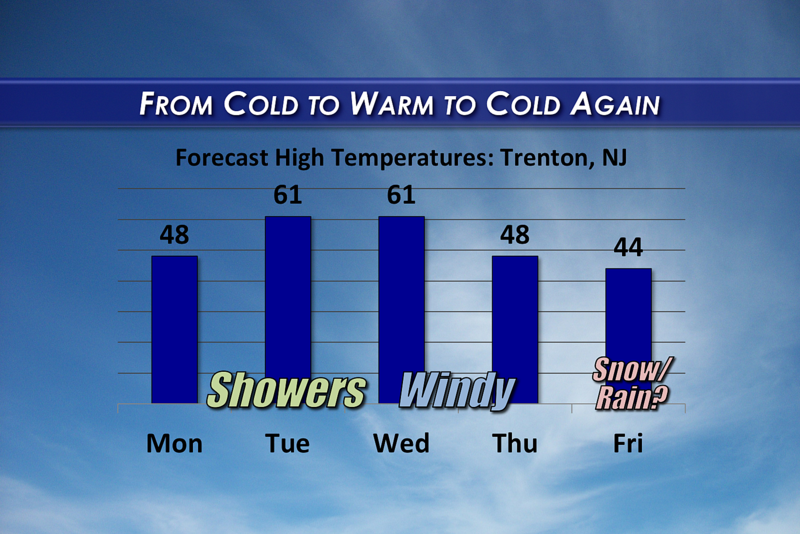 I'm happy to return that southerly winds will help temperatures climb Monday, Tuesday, and Wednesday. As temperatures warm, dew points will increase as well. The increase in warmth and humidity will also cause an increase in cloud cover on Monday. Skies across New Jersey will progress from a sunny morning to a cloudy afternoon. The clouds will limit our warming, to an extent. Highs will still reach the mid to upper 40s for most of the Garden State - that's pretty close to normal for early March. I wouldn't be surprised if we hit 50 degrees Monday afternoon, especially if the clouds hold off a few hours. Overnight lows will be chilly, but not nearly as cold as the weekend. We'll end up in the 30s for most spots. A few showers are in the forecast from Monday night through Tuesday. Most of that rain shower activity will be very light, if the raindrops even make it to the ground. The best chance for steadier rain will push across New Jersey late Tuesday. Any period of heavier rainfall will be brief. Meanwhile, despite the raindrops and mostly cloudy skies, temperatures will continue to warm on Tuesday. Forecast high temperatures are in the upper 50s in North Jersey and the lower 60s in South Jersey. Two cold fronts will deliver big changes to our weather picture. Again. The first front, scheduled for Tuesday night, will sweep out any remaining rain and clouds, but do very little to our temperature. So Wednesday should be a nice day, with abundant sunshine, a bit of a breeze, and continuing warm temperatures in the lower 60s. The second cold front will arrive late Wednesday. While this front should be dry, it will kick up a brisk northwesterly wind. That wind will bring back cooler temperatures for the second half of the week. Thursday will be sunny, breezy, and seasonably cool. High temperatures should be in the upper 40s to lower 50s. A shortwave will bring a quick hit of snow and rain showers early Friday. I suppose an inch or two of accumulation is possible (but far from a sure bet) in the coldest spots. Friday afternoon's high temperatures will decrease even more, to the lower to mid 40s. And Saturday gets downright cold once again, with highs only about 35 to 40 degrees. As you may know, I have a strong dislike for long-range seasonal forecasting. I think many times, forecasters go too far "beyond the science" when making a long-range prediction. I don't think there's a meteorologist out there who accurately predicted this winter season - or even close to correctly - which confirms my skepticism over forecasting beyond a week at a time. Having said that, I made an assertion a few weeks ago: Our weather conditions for specifically the first weekend of March would be very telling in what to expect for the transition from spring to winter. If we maintained record warmth through that first weekend of March, I feared there wouldn't be enough time for cold air to build and surge to provide one more shot of snow. If, however, temperatures took a turn for the cold, we would still have a chance for a major snowstorm. Especially since March is a notoriously snowy month for New Jersey. So, what happened? It was incredibly cold this weekend! So, while many forecasters have already called for "the end of winter," I am absolutely leaving the door open for significant snow yet to come. Is it a guarantee? No way! Just a decent possibility. Ohhhh, and look what's showing up on the models for next weekend! Both the GFS and European show a significant storm system passing right over New Jersey in the Saturday night-Sunday time frame. However, let me stress very clearly: While the two models are in line with this possibility, there is zero run-to-run consistency regarding the timing, track, and impacts of this system. I've seen solutions ranging from "all rain" to "double-digit snow totals". As we're still 5-6 days away from this potential storm, I will remind you again, as I do every time snow (major or otherwise) is on the horizon... Chill out. If the model continues to trend cold and snowy, you will see a ton of hype spewed all over the internet. Any snow total maps right now are 100% flat-out wrong - this is going to be a complicated forecast, as the precise track and temperatures of the storm system will have a huge impact on who gets snow, and how much they get. We will not be able to make a "snow or no-go" call until Wednesday or Thursday, at the earliest. When we know, you'll know. I promise.